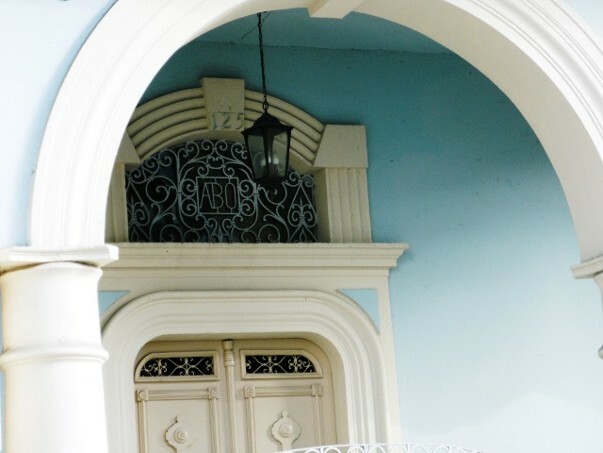 The house is located at 125 Calle Villa, in the center of town, one block away from the town square, Plaza de las Delicias. 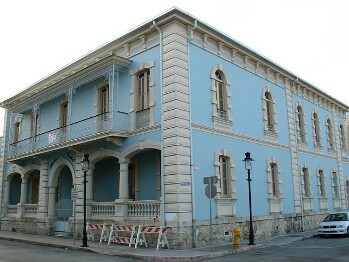 Once built for the town's mayor, my great-grandfather, Antonio Batiz Oliveras, purchased it in 1924. 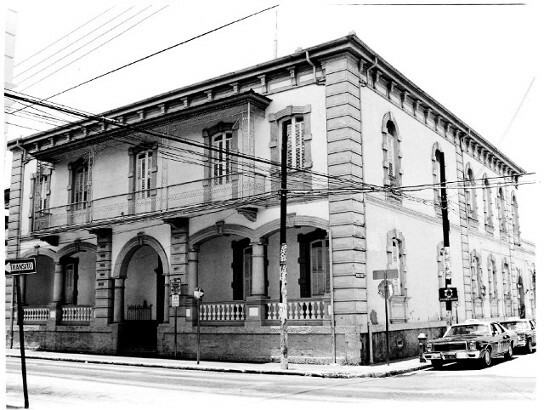 This photograpph was taken when Miriam Batiz Vasquez, the youngest of Don Antonio Batiz's children, applied for landmark status, in 1985. June 10, 2012 - I am part of the leadership of an organization I co-founded in 1996 called The Hispanic Genealogical Society of New York. The society hosts field trips to Puerto Rico every couple of years and this year we visited the archives and sites of my family's home town, Ponce Puerto Rico. I had the pleasure of walking around the streets of my family's past with a group of people whose roots were firmly implanted in the old town. I brought the group to the house my mother, Carmen (Lily) Batiz Sierra, was raised and had wonderful memories in. As I spoke about my mother's family and their life in this town, we walked closer to the house as I pointed out some of what I knew of the residence. One of our members, Mary Donelson, a Ponce native herself, asked what the initials meant above the main entrance of the house. At first, I didn't know what she was talking about and got closer to the entrance and saw clearly what she meant. In the center of the decorative grating above the main entrance were the letters ABO. For a few seconds, I found myself glued to the ground, speechless, and so moved by what I could identify with certainty was a remnant of my great-grandfather's life there. These were the initials of Antonio Batiz Oliveras! My jaw dropped in shock and pure joy. I experienced goosbumps in disbelief, and I swear if there weren't so many onlookers I would have gotten a bit misty. My compañeros smiled as they realized this was a new discovery for me, and true connection to this town where my ancestors once lived. Now, you have to understand, I lived around the corner of this stately home, on Mendez Vigo, as a teenager for a short time. Even attended university for a short time in what was Universidad Interamericana, right across the street. I have also visited the house and photographed it countless times, but i have never noticed my ancestors identifying initials on the house. This discovery was made in the beginning of our trip. I turned to my travel mates and said. "That's it, I can go home now!". It was true! I was on cloud nine for the rest of the trip, telling everyone who would listen and many, I suspect, who didn't. Thank you Mary Donelson for noticing what would become the most memorable moment of my trip back to the land of my ancestors. After the trip, I came upon the application submitted by Miriam Batiz for historic status, There were several interesting pictures including the b&w one above. Enjoy. The house is gaining some notoriety these days. One of our primas, Kamey Batiz Garcia, found this Wikipedia entry for the house. It's a history of the house, the structure, who built it, its first inhabitants. Very interestring stuff. THE HOUSE AT "LA QUINTA"
October 12, 2016 - For Batiz family members, we have always heard mention of "la casa de La Quinta", referring to the family country home in Guaraguao, Ponce, a neighboring rural mountain town, near Marueño. The house was described as having a long staircase, openng to a balcony that ran across the front of the house. Entering, this level you were met with an open garden, similar to many Spanish style homes, and some bedrooms lined around the walls. The 2 level home had bedrooms also lined with bedrooms, like in a school (my mother described). There was a lower downstairs level where the "help" lived, and where the kitchen was. If anyone has a better description, please let me know.